Ez Tie Adult Clothing Protectors: Our Ez Tie Clothing Protectors Outlast Hook And Loop And Snap Closures. This Is The Clothing Protector Most Likely To Stay In Place For An Entire Meal. It Is Also The Easiest To Launder: Not Hot Snaps To Burn You And No Hook And Loop Closure To Catch Lint Or Melt. You Don'T Have To Tie The Ez Tie In A Knot For It To Stay In Place! 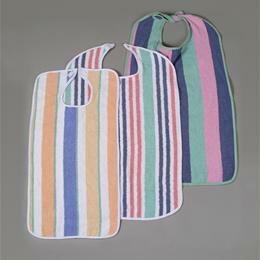 22" X 41", Multi Color Stripe, 90% Cotton/10% Polyester.